It is New Year's Eve and time to celebrate! Wishing everyone a year of love, health, happiness, and prosperity along with tons of creativity to keep the mojo juices flowing. Speaking of flowing, time to open the bubbly and pour a glass to toast in the year. 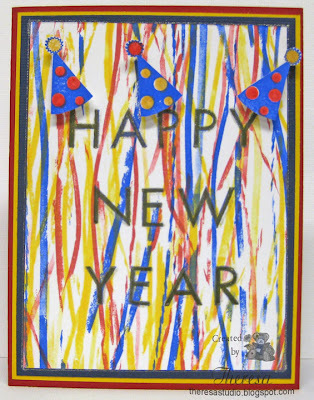 Here's to 2011...may it be good to all of us. I made my champagne bottle card with a template offered from Simon Says Stamp Challenge Blog. Check it out here. I printed the template and cut it out in this shimmery green luminescent CS (can see on open card) that I being saving for the right project. I printed the label from a free digi by Tiffany Doodles and cut with Spellbinders Label 4 and edged with a Pilot gold marker. I covered the top and neck of bottle with a scrap of gold wrapping paper left from Christmas package. Tied ribbon around the neck and added a bit of bling. Finished off the inside of bottle with sentiment from GKD "Lovely Labels 1" by Nina and cut with same label die. Almost time to ring in the New Year...2010 has been a good year except for that fall in January when I broke my wrist...bad way to start off, but... the year ended better than it started. It has been a good year carding and blogging...a lot of new friends and old friends have added so much enjoyment to this past time. I have learned a lot and keep trying new things such as the technique in this card. Made the "streamers" using the rubber band technique that I saw on Stamp TV in one of Gina's great videos. Technique is to use rubber bands on a brayer but I have no brayer so I improvised with a glass water bottle. I only rolled up and down instead in all directions because I wanted the effect of streamers falling down. 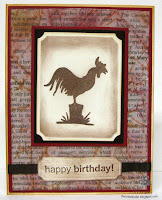 Added some party hats for fun stamped with GKD "Candles on Your Cake" by Melanie. Text stamped with Fiskars Basic Font Stamps. Inks are SU and Momento Markers and Papers from stash. Used Atyou Spica Gold and Sakura glitter pen on letters but does not show in photo. For Fun Challenges: Theme is New Year. What are your plans for New Year's Eve? I plan to spend a quiet night ringing in the New Year with my DH. 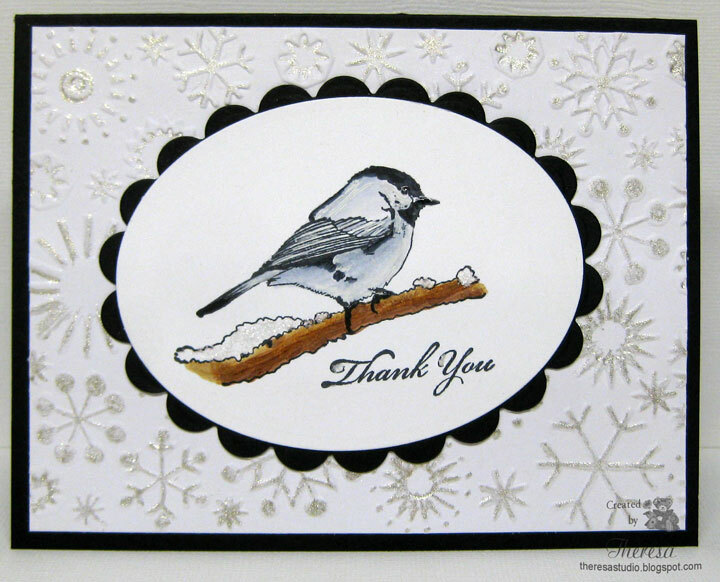 A simple and easy card to say Thank You and to think of spring. Stamps are from GKD "Spring Florals" and "Winter Wings". 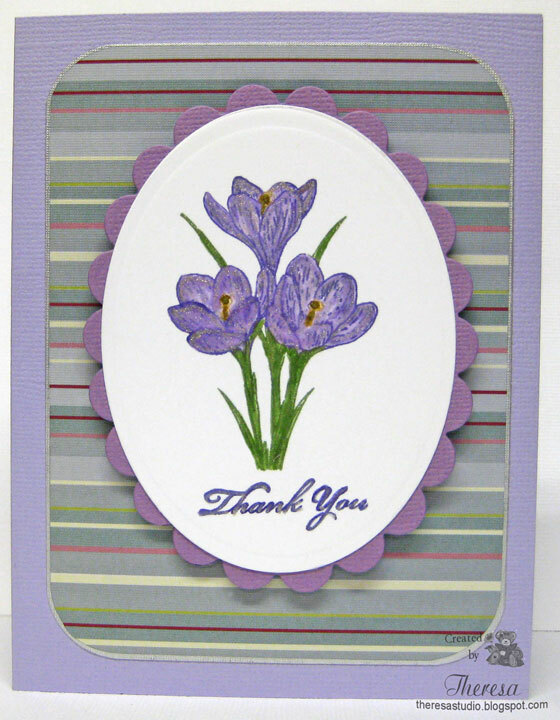 Crocus are colored with Memento Markers and highlighted with Sakura glitter pen. Used a scrap of Lilac Bazzill CS for mat and a scrap of stripe paper from My Momenta. Base card is also Bazzill CS. Edged stripe mat with Pilot Silver Marker...almost looks dimensional on card. C.R.A.F.T. Challenge: Theme is Thank You. Cupcake Craft Challenge: Theme is Thank You. 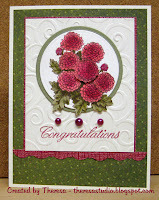 Phindy's Place Challenge: Give Thanks with Scraps-scraps of lilacand white cs and stripe dp were used. Thanks to all my friends and followers who have stopped by this year and left comments and encouragement. I appreciate all your visits and look forward to seeing you often in the new year. These cards are all made by using wax paper with Cuttlebug Embossing Folders to create a design on card stock ...I loved this technique so much that I made 3 cards using different EF's to see what effect I got. This is a lot of fun...give it a try. Go here to see Gina K's video. Top card uses CB EF Floral Fantasy and GKD Stamp from Signs of Autumn. 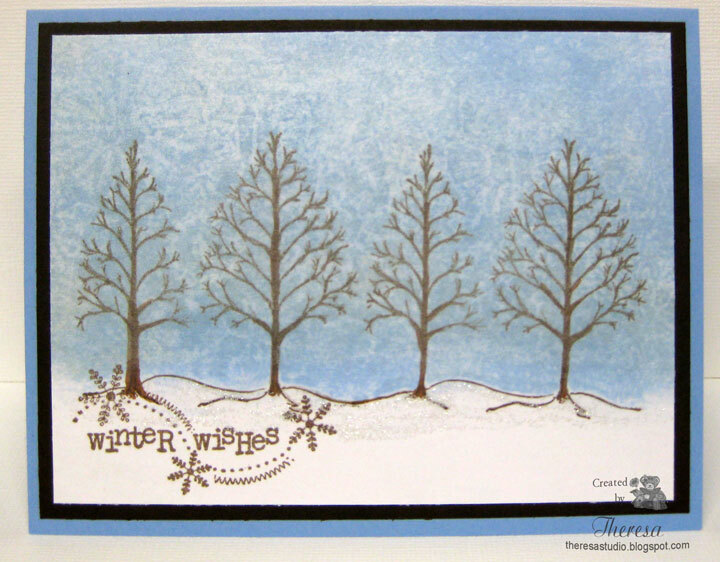 Stamped with Memento Rich Cocoa and used Memento Desert Sand to ink the wax paper design. Image colored with Copics. Sentiment is from GKD Say It with Flowers by Melanie. CS is GKD Ivory and Brown and SU Marigold. 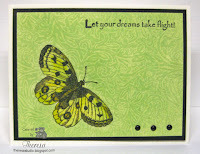 Middle Card: Uses CB EF Victoria and GKD Stamps from Take Flight. Stamped with Memento Tuxedo Black and used Memento New Sprouts to ink the wax paper design. Image colored with Copics. CS is GKD Ivory and Black. Bottom Card: Uses CB EF Snowflakes and GKD Stamp from Life is Good. Stamped with Memento Rich Cocoa and used Memento Summer Sky to ink the wax paper design. image. 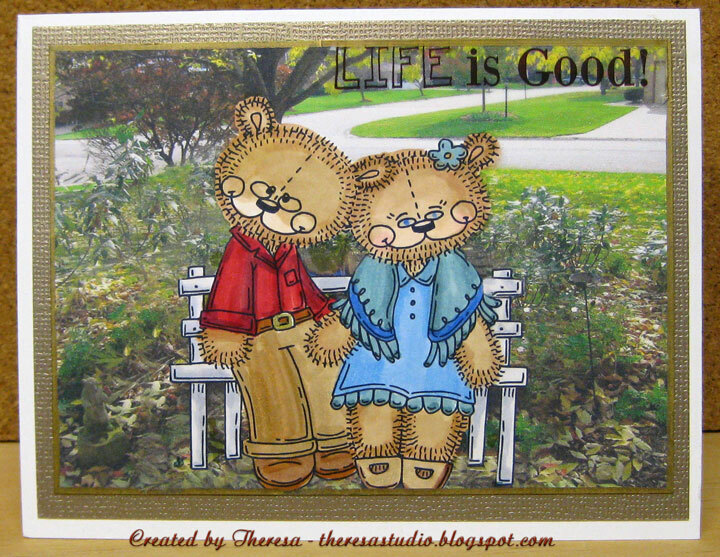 Sentiment is from stamp from Christmas gift. CS is GKD Ivory and Brown and Blue Cs from stash. This card does not show the background design as well as the first two. 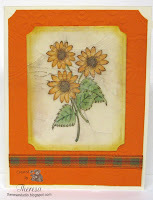 Today I am showing a card made with the Cracked Glass technique shown at Stamp TV. Used a stamp from GKD Signs of Autumn stamped with Memento Rich Cocoa and colored with Copics YR 20,21,12, YG 93,95,65, E25, 66. Used GKD Ivory CS and Orange CS from stash. Added ribbon from Jo-ann's. Card on left is made using Distressed Newspaper. Used Tim Holtz inks Tea Dye, Brushed Corduroy, and Aged Mahogany on newspaper. Added to a mat of Red and base of Ivory that was sponged with distress inks. Stamped image from GKD Signs of Autumn using Memento Rich Cocoa on Ivory CS and matted on Red and Brown CS. Added ribbon and sentiment from GKD Candles on Your Cake. Made both for the Year End Countdown Challenges at STV. Welcome to my blog! I have been away from blogging over the Christmas Holiday but ready to resume some regular posting, at least posting when I can. I hope that everyone had a lovely and safe holiday and that you were blessed with love and friendship. We had a wonderful holiday and enjoyed it tremendously. Hope the snow did not disrupt too many of your plans. I have been working on some projects for Stamp TV"s Year end Countdown challenges. Check it out here. The is a seies of 10 challenge including techniques of Split Negative, Faux Window, Distressed Newsprint, Adding a Button to a Bow, Shimmering Background Paper, Cracked Glass, Cuttlebugged Waxed Paper, and Rubberband Background and more to come. 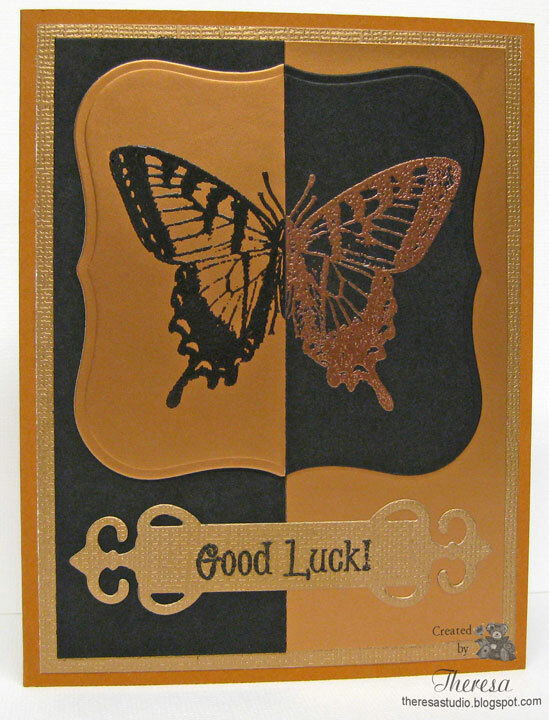 I used Gina K Butterfly Stamp from Hope is Faith and sentiment from GKD Take Flight and Good Luck sentiment from Mark's Finest Papers. I used Ranger Black EP and Copper Pearl EP on GKD Black CS and Copper metallic CS. Card on left has DCWV Metallic CS and right one has base of GKD Pumpkin Spice CS. Used Spellbinders Labels 1 and Fancy Tags. 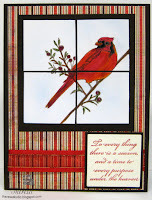 Used bird and sentiment stamps from GKD Winter Wings by Asela...colored with Copic to be a Cardinal but may really be a Bluejay? Stamped with Memento Rich Cocoa and used Copics YR07,YR12, YG63,E25,R59,24,27,29,RV29. Used GKD Brown and Ivory CS and Basic Grey Jovial. Added glossy accents and ribbon. 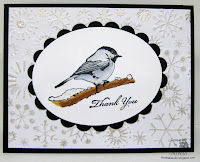 Used Chickadee and sentiment stamps from GKD Winter Wings by Asela. 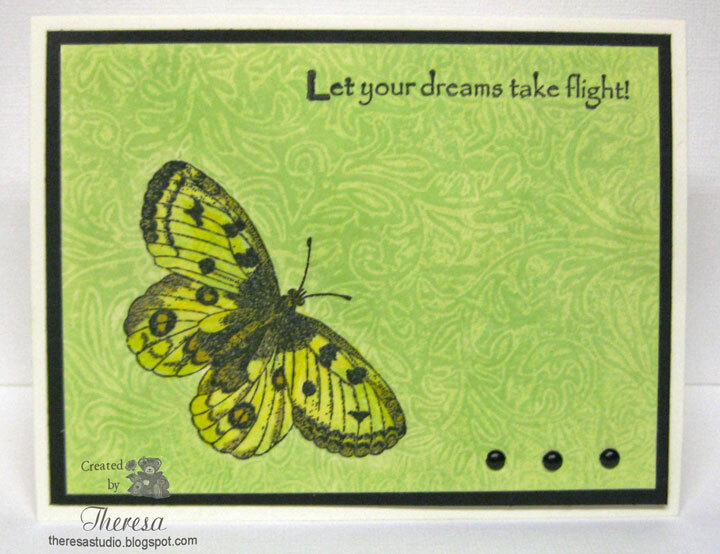 Stamped with Memento Tuxedo Black and colored with Copics C00,1,3,9, E25,39,55. Cut image with Nesties oval and scallop oval. Embossed white mat with Cuttlebug EF Snowflakes and added shimmer with Sakura Clear Stars Pen. Added Frosted Lace Stickles and Glossy Accents to image. 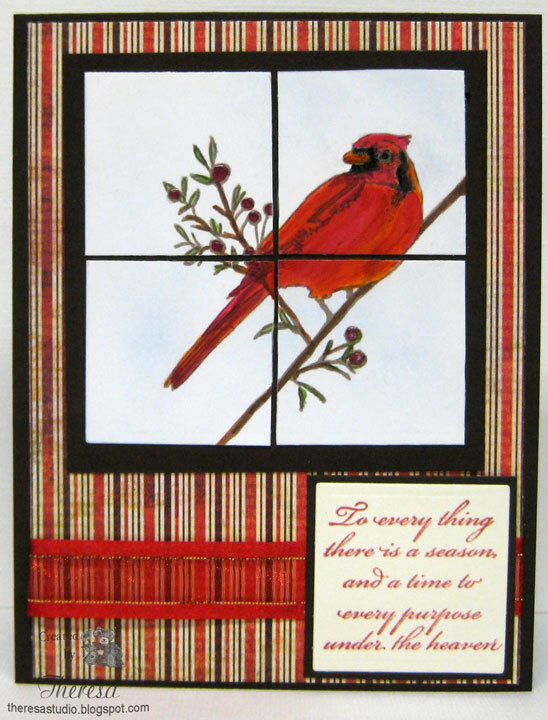 What a fun way to reminisce about cards that we have made this year. 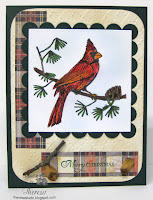 At The Manic World of Mrs. Weyremaster, there is a blog hop to feature your fave cards of 2010 Dec 28 and 29. She is asking bloggers to share ten of their favorite cards/projects created in 2010. 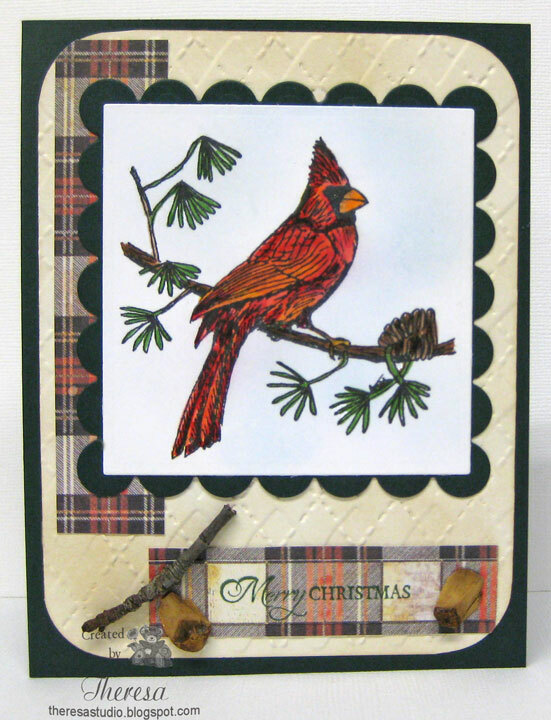 The objective is to let all the cardmakers/crafters out there in blogland showcase cards they have made this year. You don't need to create anything new, all you need do is select 10 cards/projects you've made this year to share. The links close on December 29, so hurry and get yours Top 10 posted. Check here for the details and more Top Tens. ﻿It is hard to select only 10 favorites. I have discovered some new (to me) stamp vendors and see that most of my favorites are from cards that I made with Flourishes and LOTV stamps. In the comments please tell me if you have a favorite of my Top Ten and which stamps are your personal favorite. Ready for SUN and SAND? I am ready for some sunshine after all the snow and grey skies. 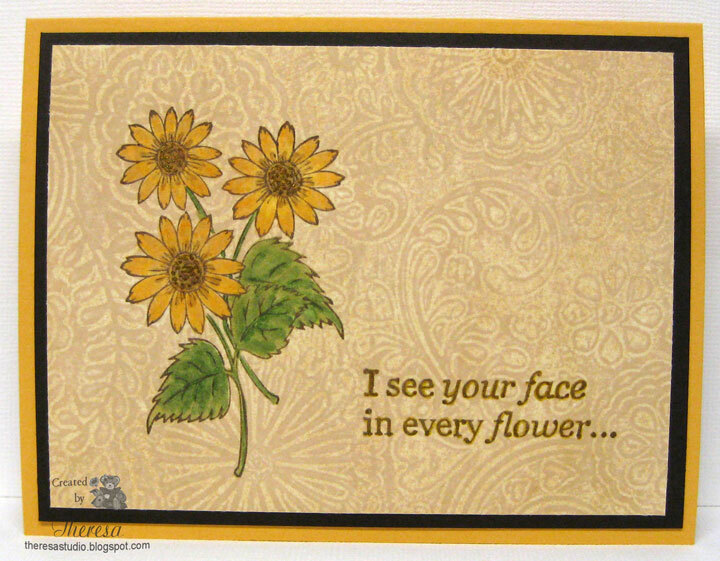 I recently won the "Hello Sunshine" stamp set that is a new release from Mark's Finest Papers...what a great set to bring on some sunny cards! 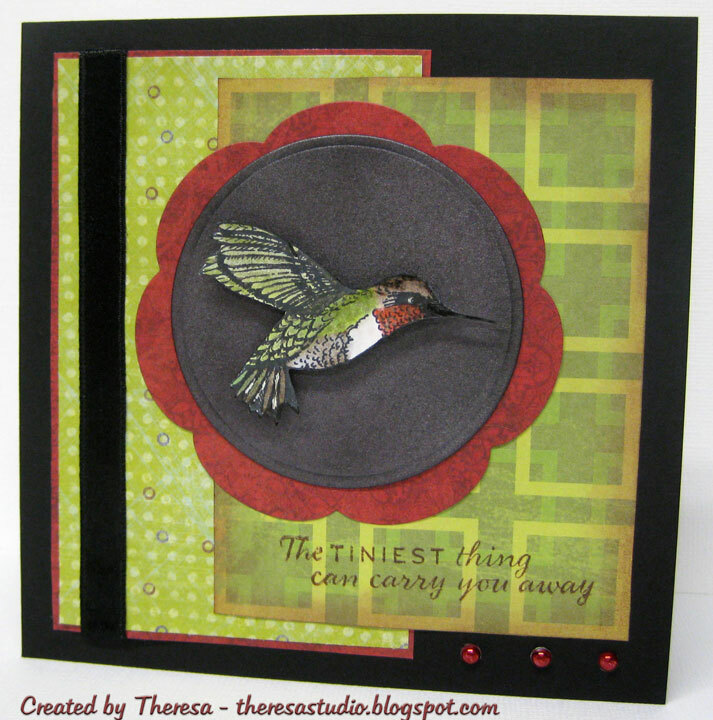 I made this card for their color challenge to use Mustard, Blue and Green. I used the same stamp twice...once using Memento Cantaloupe ink and the second time I inked the stamp with Memento markers in Summer Sky, Bamboo Leaves, Rich Cocoa, and Black and sponged it with Summer Sky. I cut out the first image stamped in Cantaloupe and then cut the center out with a Nestie circle and layered this over the scene. Used Blue CS as base card and layered with a striped mat from DCWV Citrus mat stack embossed with Cuttlebug EF Diamond Wave. Stamped sentiment from this stamp set on an oval . 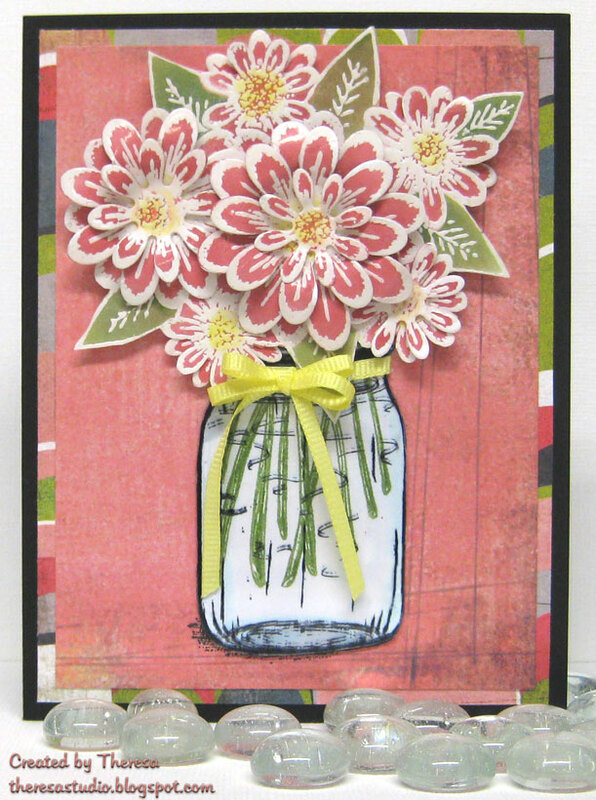 Assembled card with ribbon, buttons, sentiment and the image using a Sketch from Card Patterns. This will be a card for my SIL recently retired. Speedy the Cat's Friends Challenge: Use mustard, blue, green. Think the cantaloupe ink is a good color for mustard? Card Patterns Sketch 95: Shown to the right. Hello....Christmas is almost here. Today I am to do grocery shopping and maybe start baking some cookies and sweets. And that leads me to my card today. This was inspired by a challenge at Meljen's Designs whose theme is Sweet as Candy (or cookies). I used 2 Meljen digis "Looks Like Christmas" and Candy Canes". I combined this with a Gingerbread stamp from Gina K "First Christmas" . 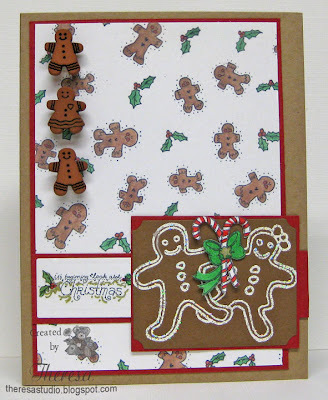 Used Kraft as base card, Gingerbread Paper from Jo-ann's, red cs scraps, and Gingerbread buttons from my button collection. Love the cutout candy canes held by the Gingerbread couple. Used a sketch from Card Patterns. Meljen's Designs: Sweet as candy or cookies. Have you finished your baking? I am always doing this at the last minute. Can you believe today is the first day of winter? It seems like it has been winter here for weeks already! This stamp from PSX of a Christmas Village is one of my old time favorites. 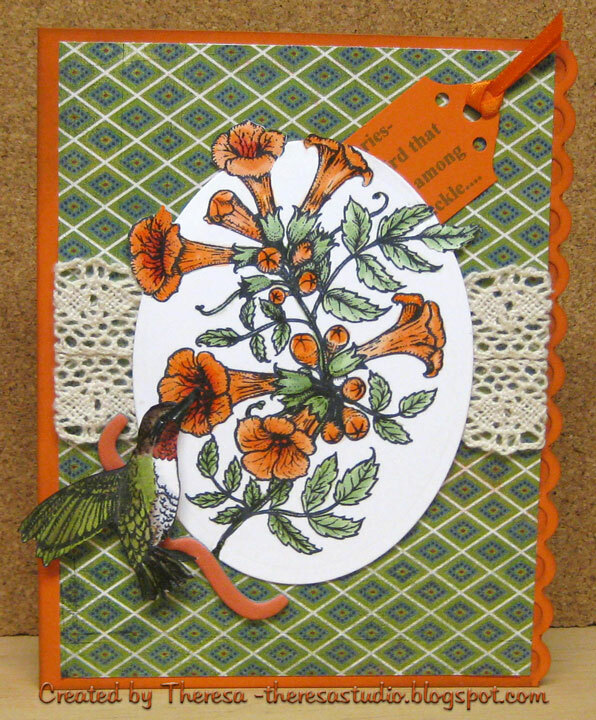 I made this card for the challenge at Pollycraft Monday Challenge and Craft Your Passion. 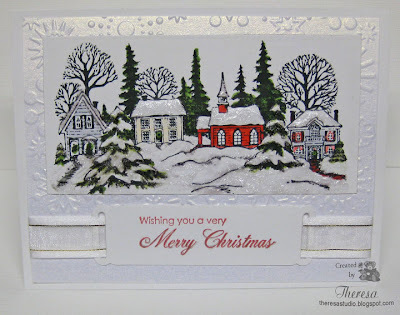 The theme Pollycraft is...WHITE CHRISTMAS...and we are to make an all white card(colour only on images) OR snowy/winter scenes. I think this fills both requirements. 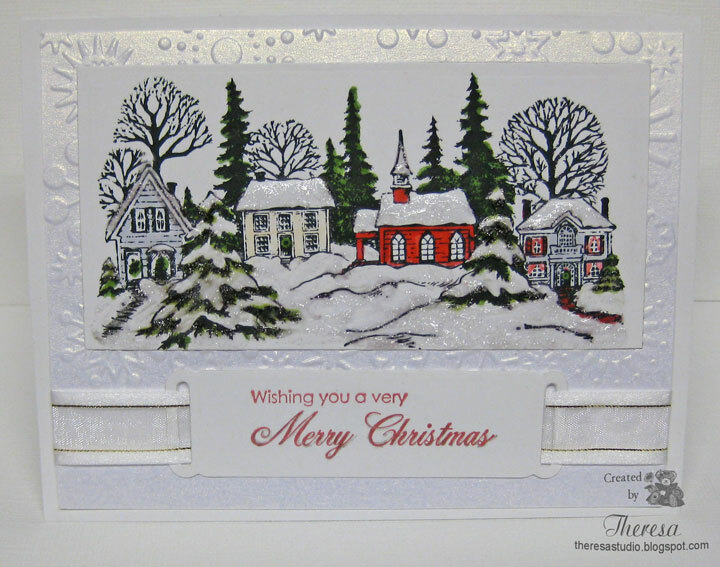 Stamped the village on White CS with Memento Tuxedo Black and colored only highlights with Memento Markers. Added some Frosted Lace Stickles to give an icy winter look. 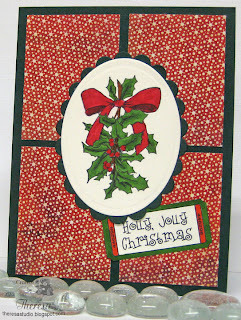 Placed this on a shimmery White CS (from stash-unknown source) that I partially embossed with Cuttlebug EF Snowflakes. Added a tag cut with Spellbinders ribbon tag die stamped with a sentiment from GKD "Very Merry Christmas" by Theresa M. I attached the tag with a white organza ribbon. Another red and green card for some challenges. 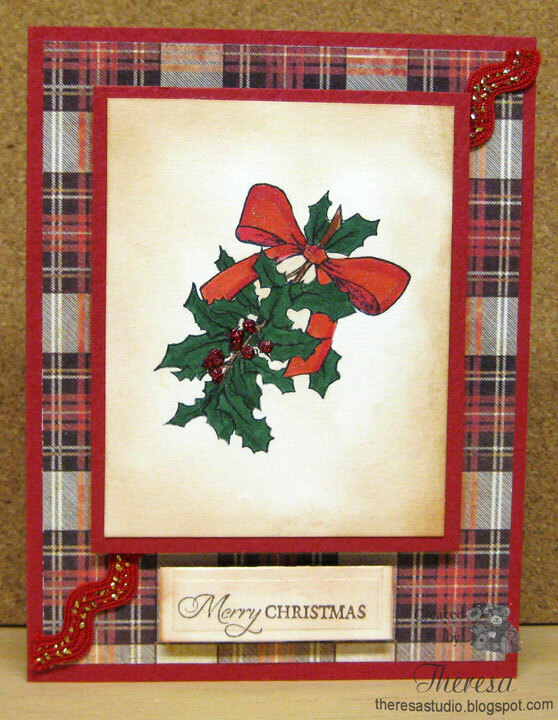 Used holly stamp from GKD "Very Merry Christmas" by Theresa M. Colored with Copics and cut out the image and scalloped mat with Nesties. Followed the sketch in this week's STV Sketch challenge. Papers are GKD All Spruced Up and Ivory CS with Basic Grey Jovial Pattern Paper. Finished with a Paper Cupcakes digital Christmas Ticket. 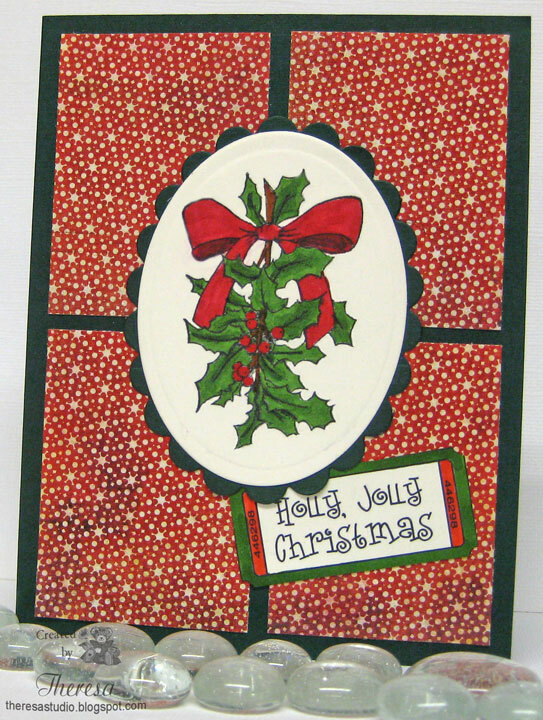 card with traditional red and green. 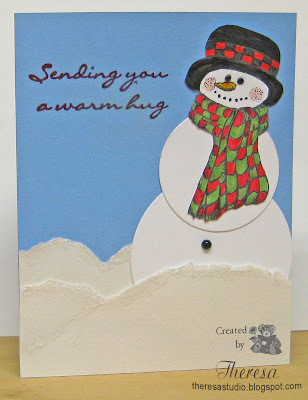 I seem to be stuck on snowmen the last few days but I had to make this card for Paper Cupcakes' There's Magic in the Air Challenge. Dru challenged us to make a Christmas card in the traditional colors "red & green". There was a Paper Cupcake image here you could download for free "A Merry Little Christmas" which I used for my card. Colored the image with Copics and gold glitter pen. Cut with circle die and matted on green circle mat. My base card is GKD All Spruced Up and the red mat is from stash. I embossed the red mat with Cuttlebug EF Snowflakes and sponged with SU Handsome Hunter ink and added glitter to snowflakes with Sakura Clear Star Pen. Added some green ribbon to finish. 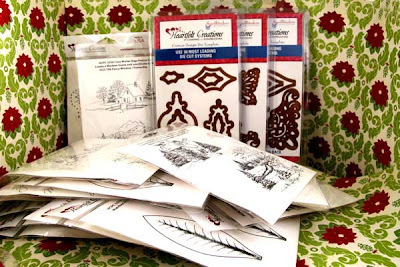 Our Creative Corner: Add color and depth to dry embossing. Crafty Catz Weekly: Do a challenge from their past challenges of your choice. I did Challenge 60- Christmas. Annabelle Stamps: Say it in green and red. I made these quick and easy tags to use on gifts. 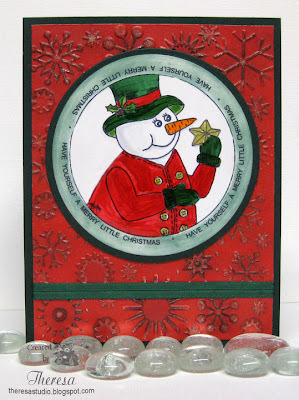 Stamped the snowman face using Heartfelt Creations Stamp 3342 and colored with Copics. Cut out the face with scarf and attached to a circle cut with Nesties die. Stamped the back of tag with GKD stamps "To" and "From". Quick and Easy. Scrap-Creations: Make it a tag. Fab 'n Funky: Quick and easy projects. PaperPlay Challenges: Anything but a card. Speaking of Christmas, have you seen the givaway of a Color Cubbie at Wee Memories? Studio 3 Solutions is sponsoring this Christmas Wish giveaway by giving one lucky winner a Color Cubbie!! If this is on your Christmas Wish list, go to Wee Memories to check out how to win. Good Luck! 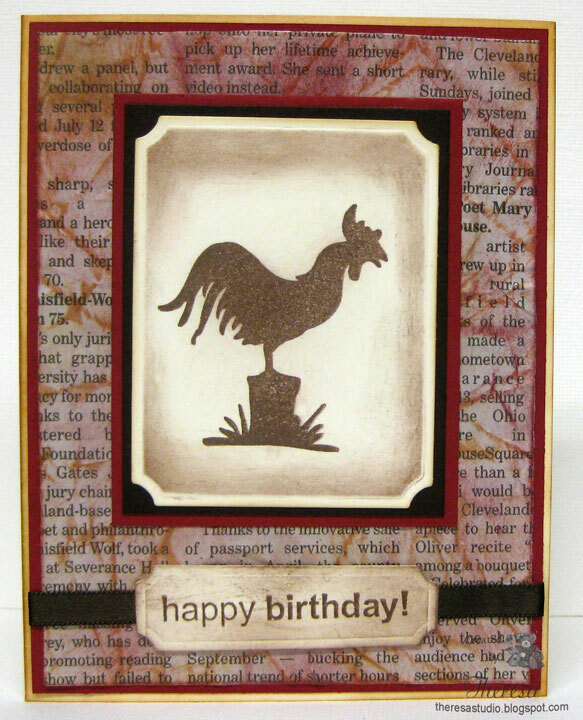 I made this card so I could use some new stamps from Heartfelt Creations. I stamped the snowman's head with the scarf and colored with Copics. 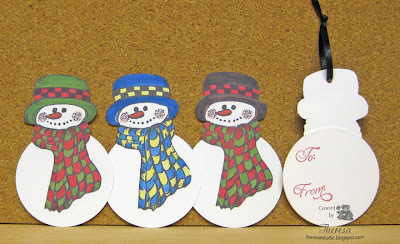 I cut out the head and cut 2 circles with dies and attached all together to make a snowman. I tore some watercolor paper to create a snow bank. Assembled the snow and snowman on a blue cardstock and added the sentiment with versamark and red embossing powder. Sentimental Sundays: Let it snow with a sentiment. Alphabet Challenge Blog: H is for Hats. Fussy and Fancy Friday: Show some snow. Fab 'n' Funky Challenges: Quick and Easy does it. Do you any snow? We have beeen getting more today. Trying to catch up on some challenges today. Speedy the Cat's Friends: Use Paper Piecing. Dress, bow and wings are paper pieced. Christmas Card Challenges: Use an angel. Let's Ink It Up: Theme is Christmas with Sparkle and Bling- used stickles, rhinestones, and glitter pen. 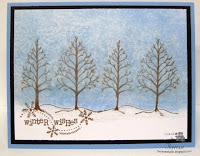 Simon Says Stamp Challenge: Use shades of silver, blue and white. ABC Challenge: J is for Jewels. Used Rhinestones. 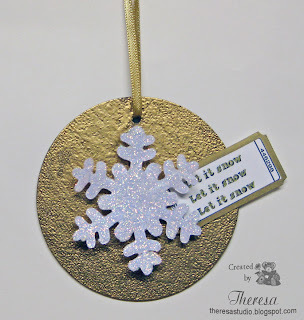 Wags 'n Whiskers: Use Snowflakes. 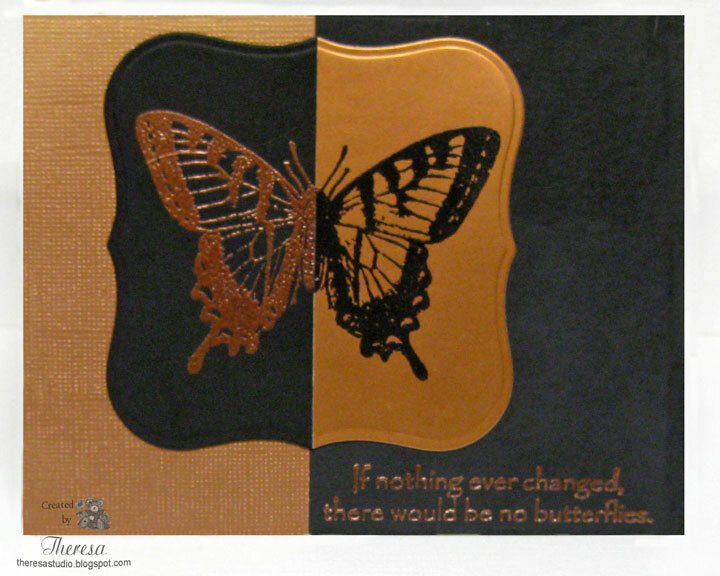 In embossing and punchout. Really Reasonable Ribbon: Photo Inspired-used silver metallics, shiny rhinestones and snowflakes. Photo below. Copics Creations: Use sparkle in your creations. 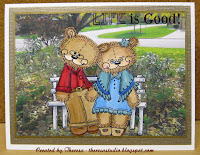 Stamps: Wag 'n Whiskers "Bear Hug"
Sorry I have been missing this week. Have been busy getting packages ready for shipping and finishing other projects for the holidays. Now it is time to bake and I have to decorate the tree which has been up for a few days but only has lights. I received this stamp recently and wanted to ink it up so I made this card to cover a few challenges. 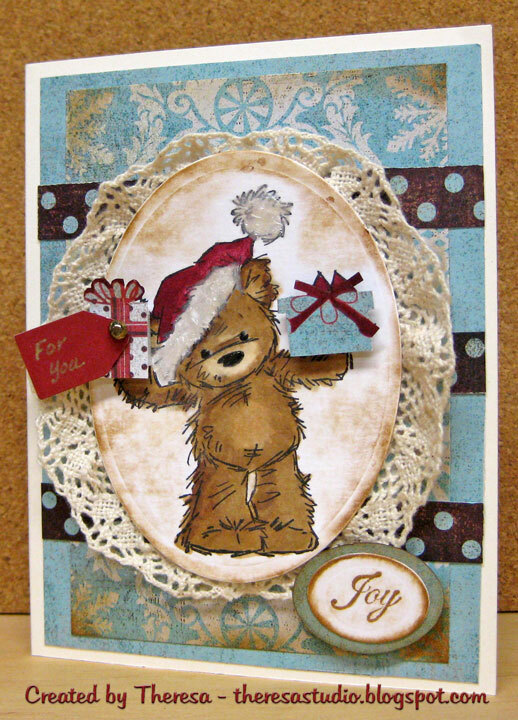 Crafty Catz Weekly: Birthday Card with a Bear. Hard to read the sentiment...says Happy Birthday...better in real life. Embossing did not photograph very clearly on the print background. Speedy the Cat's Friends Challenge: Use Paper Piecing. Scarves done with Basic Grey print. 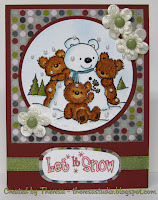 Allsorts Challenge Blog: Show last minute Christmas Projects. Papertake Weekly: Theme is Christmas Birthdays. While I was making one ornament for TMITA, I decided to do another quick one using another ticket from Paper Cupcakes "Christmas Tickets". This was very simple...I cut an ornament shape from gold metallic card stock with a Cuttlebug die. 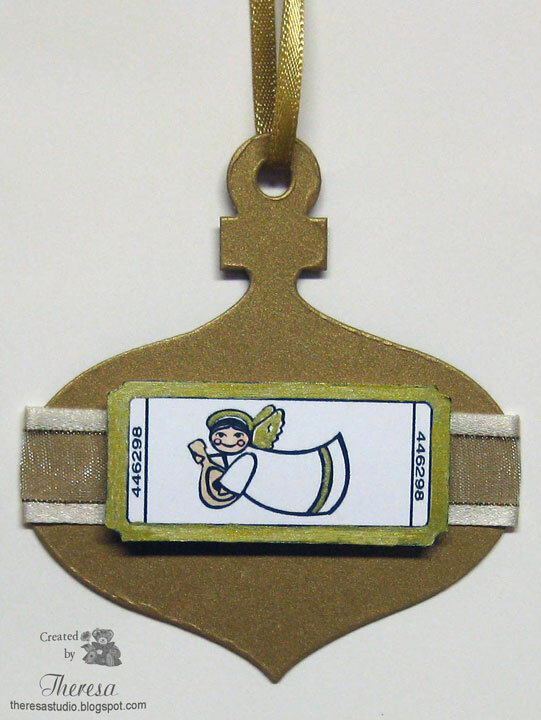 Wrapped it with an organdy ribbon-white with gold threads-and attached a copy of the Angel ticket that I printed and colored with gold marker and Copics. Attached a ribbon through the hole for hanging on the tree. That's it for today. If you have time, make an ornament and be in the challenge at There's Magic in the Air but it ends this evening. I have not had much time for card making this week but did want to make a quick and simple ornament for a challenge. At There's Magic in the Air, Carol challenged us to make a Christmas ornament keepsake for someone special in your life. It can be as fancy or simple as you like, any size, any color. 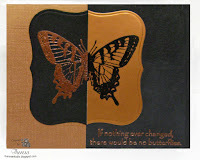 I made this one by using a circle of chipboard and embossing with gold embossing powder. Cut a snowflake with a Sizzix die and covered with glitter. Printed a ticket from "Christmas Tickets" digital from Paper Cupcakes that I won from TMITA Challenge. Assembled together with dimensionals and added gold ribbon for hanging. How appropriate for today since it is snowing. City Crafter Challenge: Create any project with some kind of image of snow on it. Digital Tuesday: Theme is Baby, it's cold outside. Hope you keeping warm if there is snow where you are. 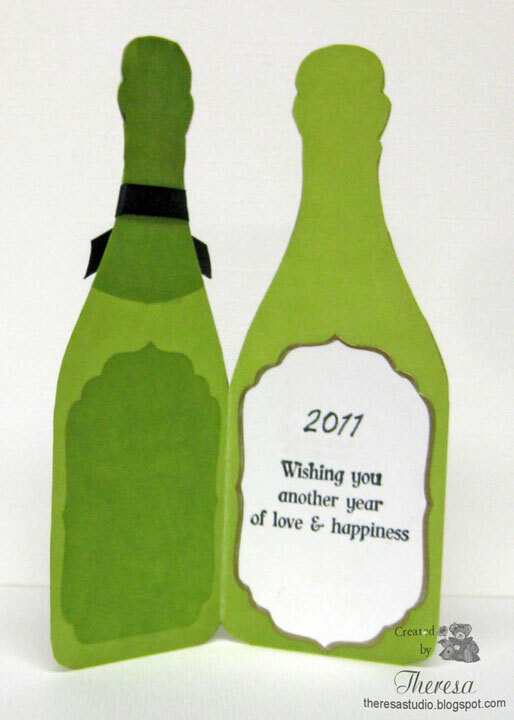 I made this card for my aunt and uncle's anniversary which is New Year's Eve....for once I have it ready in advance. I thought this beautiful Amaryllis would be great for a December anniversary. 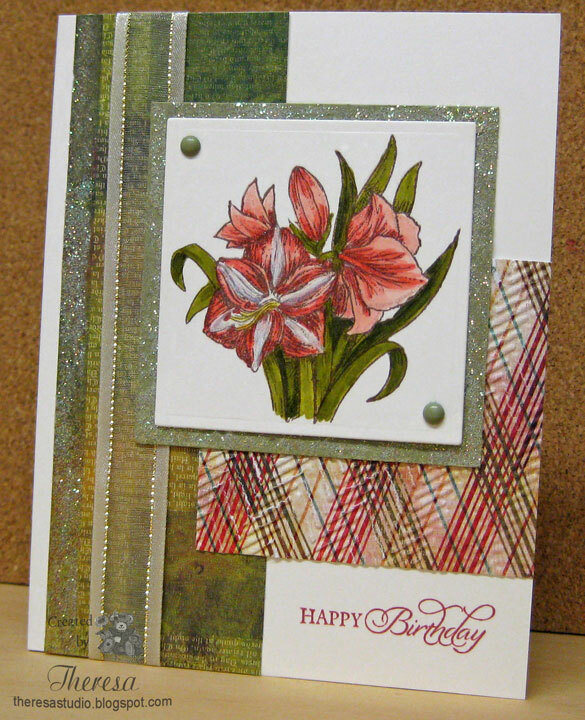 Stamped and colored the Amaryllis with Copics and cut with Nesties. Used a sentiment from Raindrop Echo Designs. 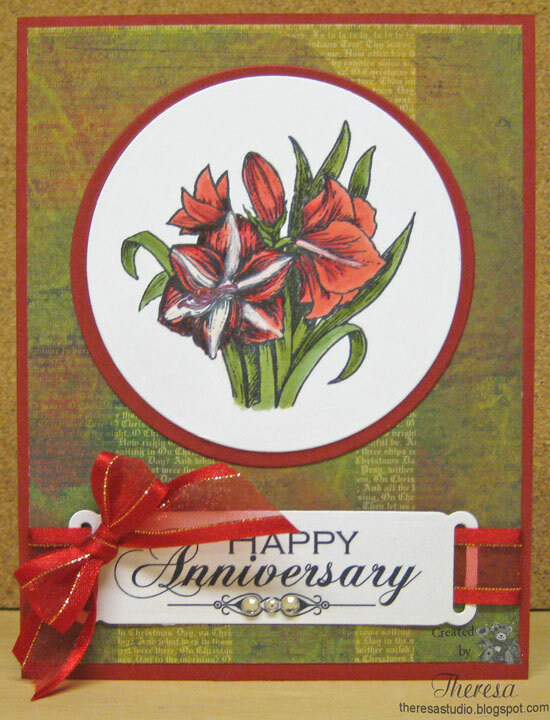 Sentimental Sundays: Make Happy Anniversary card with Sentiment. Downloaded sentiment available from this great challenge blog until Sunday. Also used another one inside but forgot to photograph. Speedy the Cat's Friends Challenge: Use red and green in a card. Let's Ink It Up: Christmas - Twist add Sparkle/Bling. Added rhinestones and ribbon with sparkle. Craft Your Passion Challenge: Anything Goes. Stamp Something: Use a Christmas Color combo on your project. 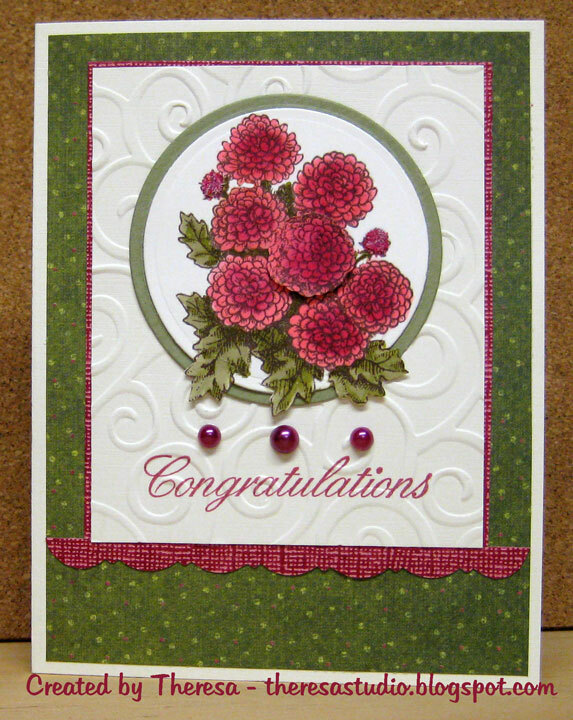 Stamps: Flourishes "A Year of Flowers"
Been busy with a lot of projects but had to take time to make this card for some challenges. Stamped holly branch on ivory cs and colored with copics. Added some stickles on the berries and used glitter pen on the ribbon. Added some sponging with distress ink. Matted image on red and then on a plaid mat that has rick rack ribbon on the diagonal. Attached to the base and added a sentiment. Stamp TV: For sketch challenge. Alphabet Challenge Blog: F is for Foliage. 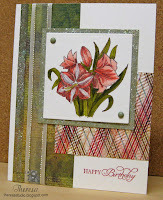 Did you join in the fun yesterday at Joan's Gardens 25th Challenge Blog Hop? Yes, wasn't it great fun! No? Then check out my previous post here or head over to Joan's Gardens blog for all the details. 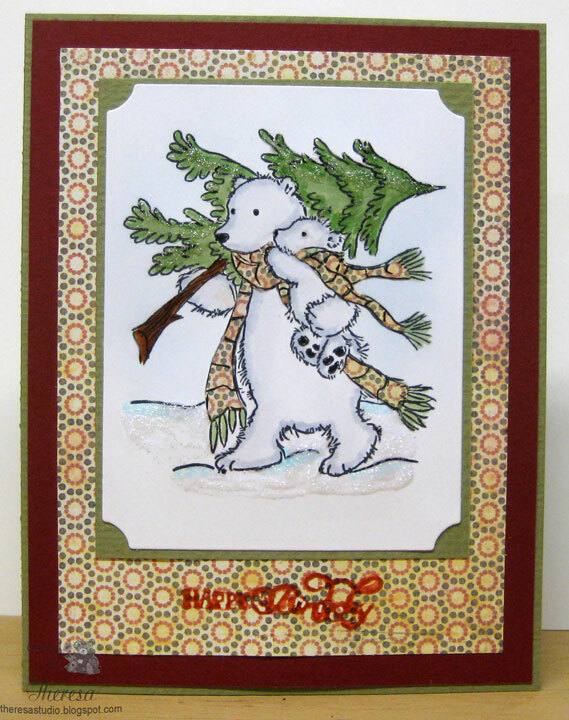 Joan is nice enought to let us also do a second card to enter into the challenge for her Grand Prize of Heartfelt Creations Products valued at $284. 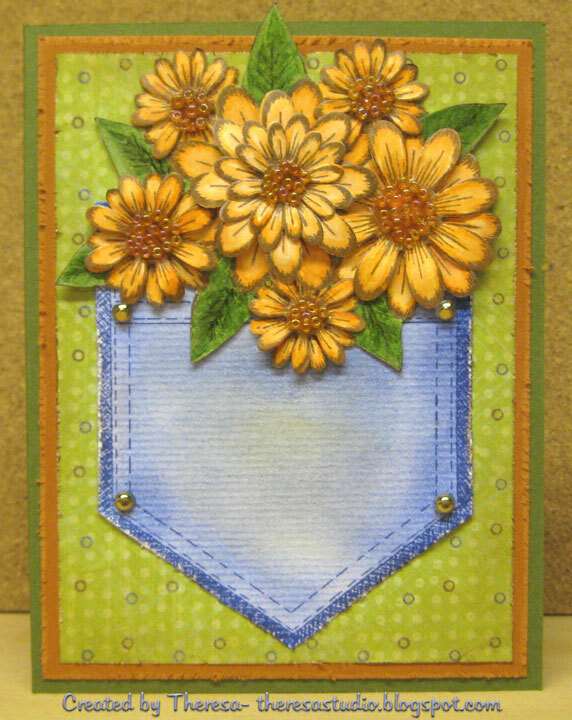 I made this card with the Heartfelt Creations Jean Pocket amd Daisy Patch Flowers stamps. I stamped the pocket on a textured white cs with Memento Paris Dusk and cut it out. Sponged and distressed it and added some brads on the corners. Stamped the bouquet and individual flowers with Memento Rich Cocoa and colored with copics. 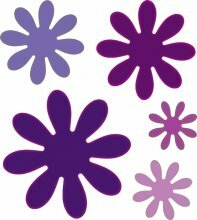 Cut these out, shaped the petals, and layered. Added beads to the centers...this took tooooo long. 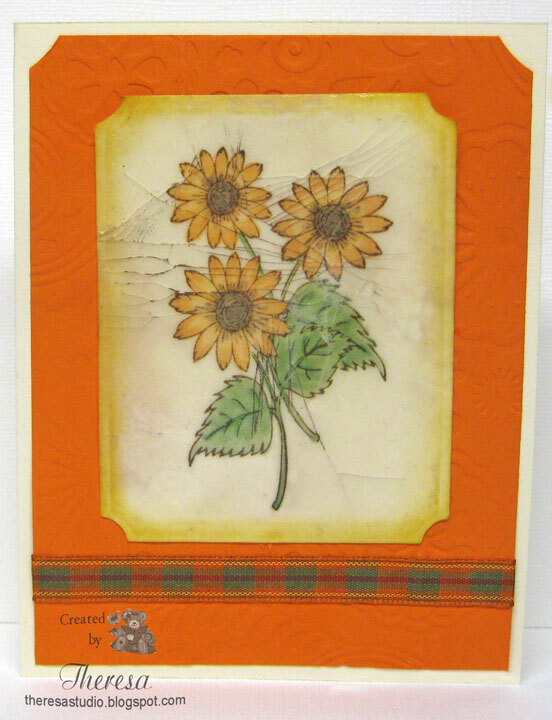 Assembled together on a patterned paper, mat of pumpkin spice and green card base. 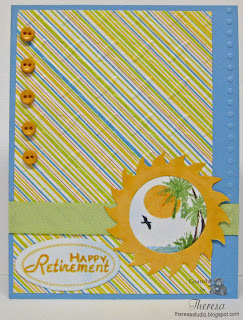 Don't delay getting a card made with Heartfeft Creations to enter Joan's 25th Challenge. Have a great day....snowing her today....great for card making. Welcome to my studio and thanks for dropping by. I am so excited to be part of announcing this ﻿﻿ EXCITING NEWS from Joan's Gardens and this blog hop featuring Heartfelt Creations. Joan is offering a chance to win an AMAZING GRAND PRIZE PACKAGE of Heartfelt Creations this week for her 25th Challenge at Joan's Gardens. This prize package includes 14 stamp sets and 3 Heartfelt Creations matching Dies with a value of over $286. Wow, who would not want to win that! In addition to this fabulous grand prize, Joan has additional prize packages from Joan's Garden's to give you an additional 3 chances to win. 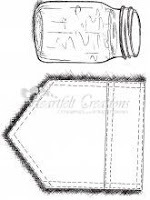 1.Create a card/project using ONLY Heartfelt Creations stamps (any HFC stamps and matching dies are acceptable) Do not use any other brand stamps. You may use any card stock, design paper and embellishments you want. 2.You must be subscribed to Joan's Gardens blog (go to her blog to subscribe) so you receive all updates about challenges and sales. The winner for the grand prize package from Heartfelt Creations will be chosen from a Random drawing and will be announced Friday morning (December 10). This person will also be entered in the End of the Year drawing for a $100 gift certificate from Joan's Gardens. 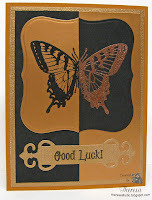 You may enter this challenge more than once, but each card/project must be made with only Heartfelt Creations stamps. Additional guidelines to enter are detailed on Joan's Gardens. See here. I am so thrilled and excited to be participating in this blog hop featuring Heartfelt Creations with 9 other guest designers plus Selma and Joan. While visiting each of our blogs, you have a chance to win prizes from Joan's Gardens. In order to be eligible for one of these three prize packages, you need to leave a comment on each blog in this Hop. Out of the twelve blogs, there are three "mystery" blogs, each with a prize package from Joan's Gardens. For a chance to win, be sure to leave a comment on all twelve blogs. The three prize packages include: 1) a group of Anna Griffin products, 2) a package of mostly Cuttlebug products, and 3) a package of mostly Webster Pages products. These winners will also be announced on Friday, Dec 10. Believe us . . . you are not going to want to miss out in participating in this challenge for a chance to win such an amazing prize package. I am honored to be listed with this group of wonderful and creative paper crafters. Theresa - http://theresastudio.blogspot.com/ You are here. Nothing looks so lovely as a fresh cut bouquet of flowers, even if they are not real. 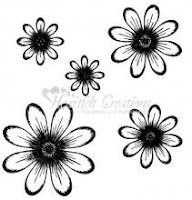 I stamped the Daisy Patch Bouquet and individual Daisy Patch Flowers on white glossy cardstock with Versamark and heat embossed with clear embossing powder. I colored the bouquet by first masking the flowers and sponging the leaves with Memento Bamboo Leaves ink. 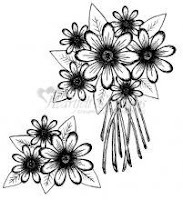 Then I masked the leaves and sponged Memento Rhubarb Stalk ink on the flowers. Rubbed off the excess ink from the embossed surfaces and added some yellow to the centers with Copic Y02. I also colored the individual flowers in the same manner. I cut out the bouquet without the stems. I used the exclusive Heartfelt Creations Daisy Patch Dies to cut out 8 individual flowers which I shaped and glued to the bouquet creating a great dimensional effect. For the jar, I stamped the Ball Jar Stamp directly on a 5" x3.75" mat of Basic Grey Pink Pattern with Memento Black Tuxedo ink, stamped a second jar on white cardstock and a third one on acetate using Stazon Black ink for this one. I stamped stems from the bouquet stamp with Memento Bamboo Leaves ink on the white jar and then colored the water with Copics B000 and C00. I glued the acetate jar to the white jar and attached a ribbon to the neck of the jar. This was then attached to the jar on the mat of pink. I then attached my bouquet of pink Daisies with dimensionals above the jar. 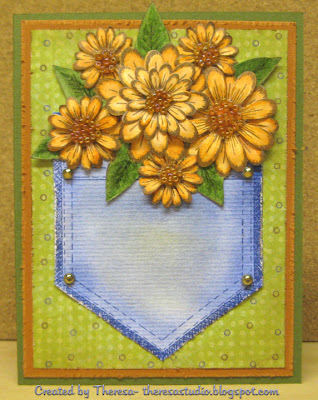 I finished the card by attaching my image to a mat of Basic Grey Pattern that complements the colors in the flowers and then to the card base of black. These stamps and die cuts make it so very easy to create lovely flowers that will be everlasting. Thanks for being a part of our blog hop. Don't forget to create your own project with Heartfelt Creations Products and enter the challenge at Joan's Gardens for a chance to win some fantastic prizes. Now it's time to head over to my very dear blogger friend, Patti, to see her truly amazing creations and give her some love. And please do not forget to leave a comment here and at each visit along the way for a chance to win one of Joan's great prizes. Have fun! Glad you made it through this long post. Thanks for visiting and I hope you like what you saw......please come back, y'all hear!